Have you heard about the NaKnitMitMo KAL yet? The group was created off of a crazy idea my friend Carol had. She wanted to knit mittens in January and get other people to do the same. It started on her blog and before she knew it it grew into a Ravelry group with over 300 members. If you haven’t checked it out yet, make sure to do so! I’ve been wanting to knit mittens and mitts and thought this would be the perfect excuse to knit distract myself with from my current projects with a pair of mitts. I picked something really easy, so as not to require too much attention. The pattern is Toast/ Toasty from A Friend to Knit With. It’s a plain tube with a thumb in the Toasty version. I haven’t decided yet if I’m going to do a thumb yet, although I probably will. I really like Dogged Knits’ version with a gusset thumb, so I’ll probably do it like that if I do a thumbed version. 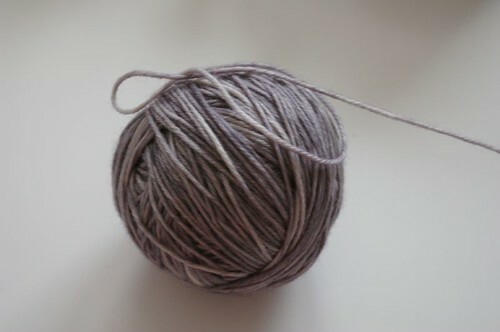 I picked a slightly thinner yarn than the recommended yarn, Madelinetosh Tosh Worsted in Tern. 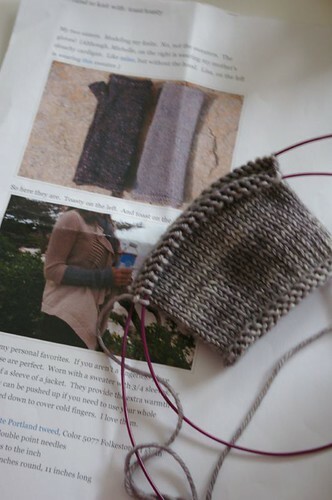 It’s a beautiful silver gray that is coming out beautiful in plain stockinette. I wanted to cast on so badly that I hand wound the yarn in the car on my way to Webs over the weekend. After a false start I ended up casting on 40 stitches and now it is smooth sailing. At least until I reach the thumb! 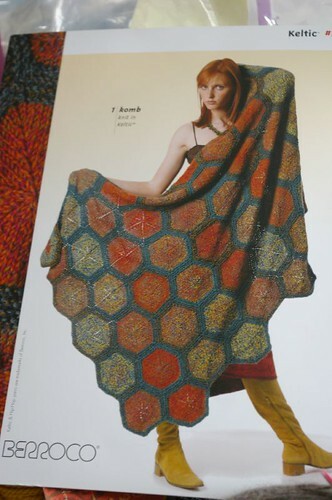 It’s really a beautiful blanket and I hope to knit it one day! For all my friends who’ve helped by knitting a sock yarn square, please click here to see what we made with it! Thank you again to all of you who’ve knitted a square, Michele was really, really happy and she loves it! Oh, that is a really cool blanket! Very nifty blanket! Can’t wait to see you create it. Cool blanket! I have Toasty on the needles right now too. BTW, I went to a quilt show yesterday and bought enough fabric to make two quilts. I’m so excited! I just started my first pair of mittens, I will check the group!